Goat cheese, sometimes called chevre, is a cheese product made from the goat's milk. Goat cheeses can range in taste from strong and pungent, to delicate and mild, however, it does have a distinct tangy flavor which it inherits from the hormones in the goat's milk. The latter is much more similar to human milk than that of the cow, being much thinner, lower in fat, and higher in vitamin A and potassium. Hence Goat Cheese is also a healthy alternative to full-fat cheese like Cream cheese, and is also a favorite among gourmet chefs. It comes in several shapes and flavors - plain or mixed with olive oil and herbs, marinated or sometimes even sampled as a dessert cheese, mixed with chocolate or fruits. In this extremely simple Tart recipe that is adapted from the Woman's Day magazine, [photo courtesy of Frances Janisch] we combine Goat cheese with Apples and Cinnamon to make this gorgeous and very delicious tart. The mildly pungent flavor of Goat cheese pairs well with the sweet granny Smith apples, and the flavor is accentuated by adding a hint of cinnamon and nutmeg to bake this tart which uses Puff Pastry as a base. The original recipe called for using Apple Jelly, but I decided to saute the apples in a sugar syrup instead, flavored with the spices so the fruit gets a deeper flavor when it is baked. Feel free to modify the recipe to pair cheese with your favorite fruit and you'll end up with a quick-fix dessert recipe that is elegant and delicious in itself. Heat oven to 400°F. Have a large baking sheet ready. Place goat cheese in freezer 10 to 20 minutes to make it crumble more easily. Unfold 1 sheet of pastry; roll out on a lightly floured surface with a floured rolling pin into a 12-in. square. Cut in half lengthwise. (You can make more cuts if you wish to make small individual-sized tarts). Place 1 inch apart on ungreased baking sheet. Prick each piece with a fork several times to within 1/2 in. of edges. Divide goat cheese into 6 portions. Crumble 1 portion on each pastry to within 1/2 in. of edges. Refrigerate the prepared sheet while preparing the apples. Peel, halve and core the apples. Slice each half crosswise in 1/4-in.-thick slices. Take a pan on medium heat and boil the water. Add the sugar to make a thick syrup. Add in the nutmeg and cinnamon, then saute the apple slices in the syrup till they become a little soft and are coated evenly with the syrup. 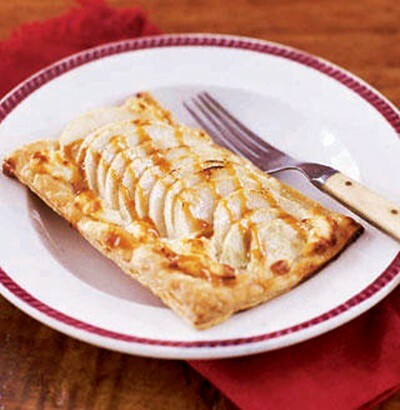 Remove tarts from refrigerator; arrange apple slices in a row, overlapping as needed, on top of cheese on each tart. Bake 30 minutes or until pastry is golden, and apples are tender and start to brown at edges. Serve warm or at room temperature with caramel sauce to drizzle on tarts. These tarts are best enjoyed warm, probably 5-8 minutes out of the oven. If you don't have caramel sauce on hand, dust it with some powdered sugar instead. If you are not much of an Apple person, no worries; goat cheese pairs well with other fruits like Peach, Plums or even cherries! Yummy. I think with less sugar this would also make a great appetizer (like those puff pastry fruit and brie wheels).